The Ho Chi Minh Mausoleum. Long queues of people to visit; no photos permitted inside. One of Ho Chi Minh’s houses, part of the original French-Colonial Governor’s complex. This was his study. Note the photos on the wall. The armored car provided by the Soviet Union to Ho Chi Minh, one of three cars he owned. The lake house was built for Hi Chi Minh to resemble the “highlands housing” he lived in during the revolution. 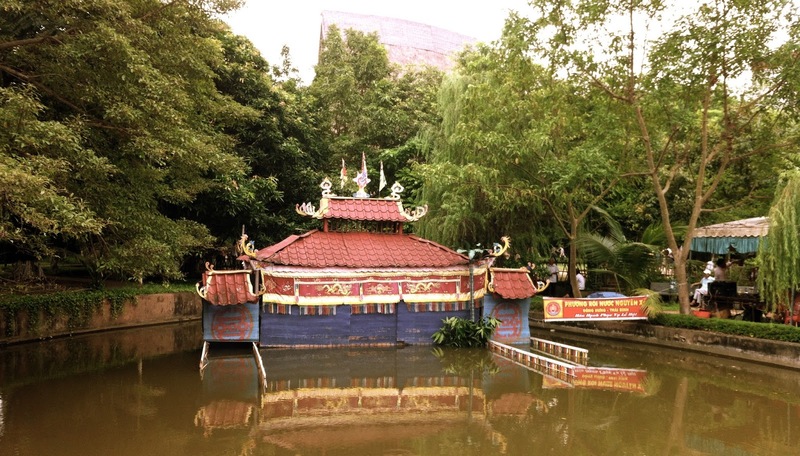 Ho Chi Minh’s private lake. Speaking of lakes. Truc Bach Lake, the site where John McCain landed and was captured in October 1967. The monument at the site of McCain’s capture. The Hanoi Presidential Palace, built to house the French Governor-General of Indochine. 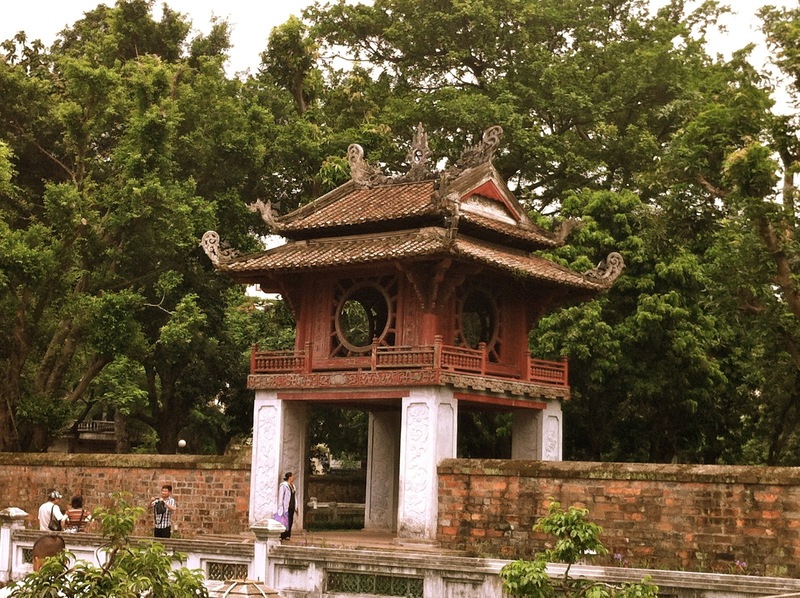 The inner courtyard of Van Mieu. Legend has it that the sapling that became this tree comes from the temple in India and the monk who became the first Buddha. 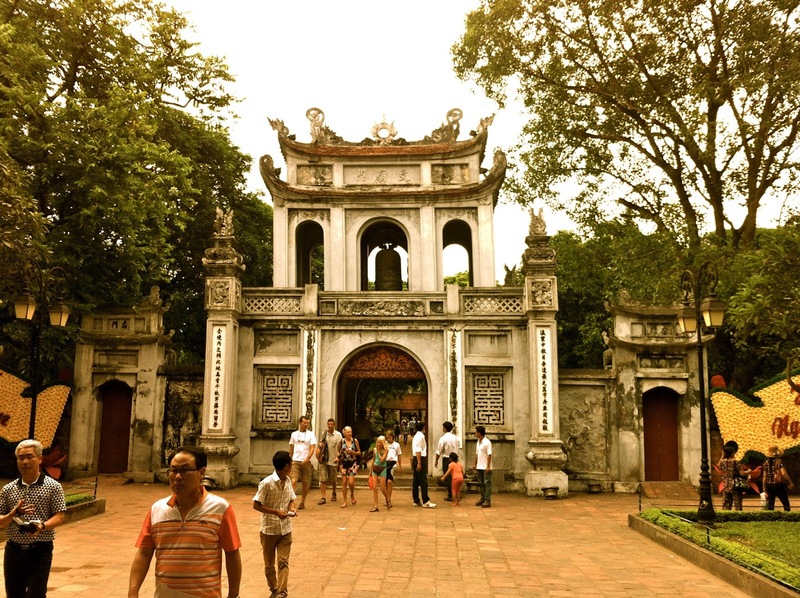 Tran Quoc Pagoda. “Tran” is the second most common Vietnamese surname, but trails “Nguyen” by quite a bit. Hanoi’s Museum of Ethnology displayed the environments of many of its 54 officially recognized ethnic groups. Long Houses are from a matriarchal village; the more daughters a family had, the wealthier they were, and the longer their house was. Another sign of a wealthy family, large and numerous wine vessels. 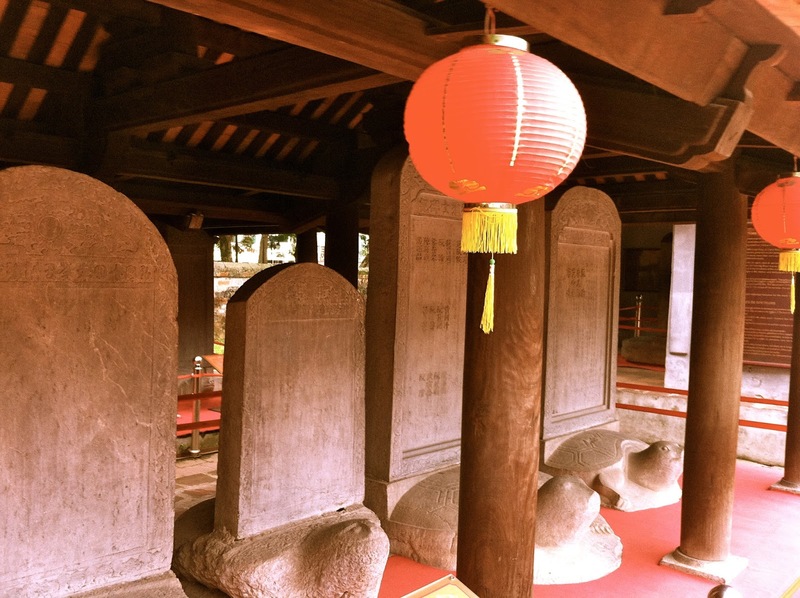 In this Homg culture, the only item of sacred value was the staircase. If the family moved, the staircase was moved with them. In this culture, homes were of mud, and had few, if any windows. 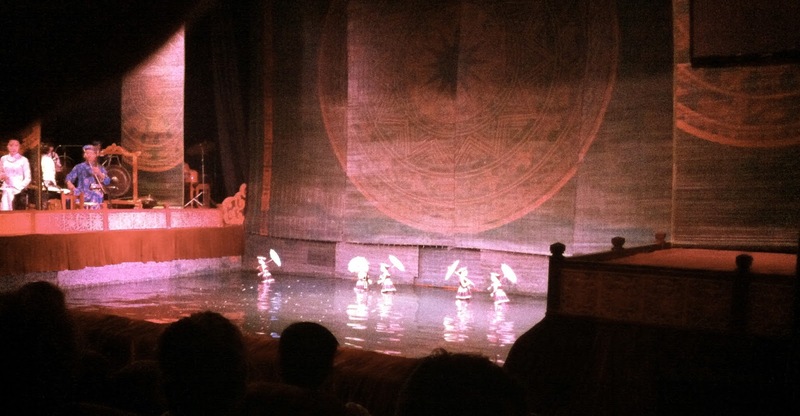 Thang Long water puppetry in Hanoi. A tradition dating back to the 11th century, as a resourceful (and entertaining) way to make use of flooded rice fields. 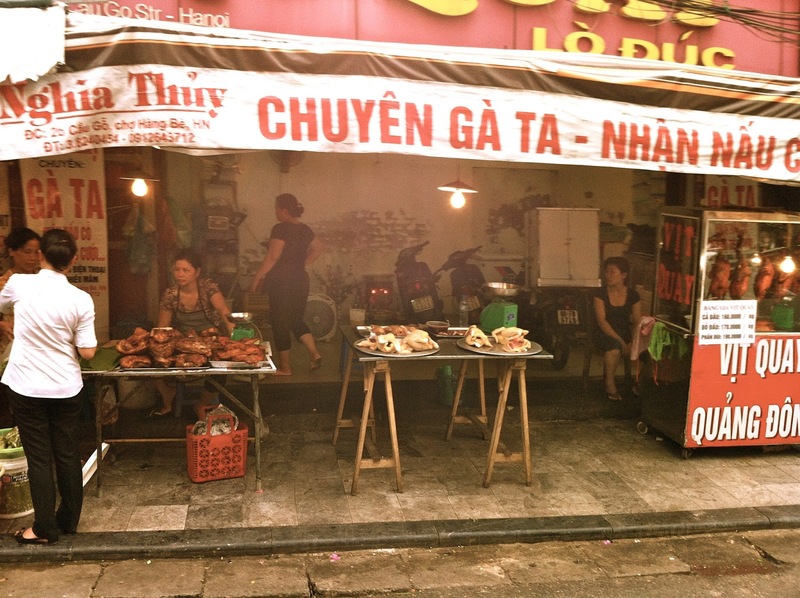 I am so jealous I did not brave the soupy steam of Hanoi to join Tony. I shan’t make a mistake like this again. Tony spent a week in Hanoi recently for work; I was smart enough to take a pass on 7 days of hot, sticky, and humid weather to join him and so traveled to Vietnam vicariously through his iPhone photos. Look closely at the photo. Do you see what we see? I wonder if the chicken became part of Tony’s noodle dish? Tony reported that the meals he enjoyed tasted as authentic as the Vietnamese food we enjoy in Eden Center (Little Asia) in our neighborhood in the U.S. Nice to know we’ve been experiencing real food all this time! 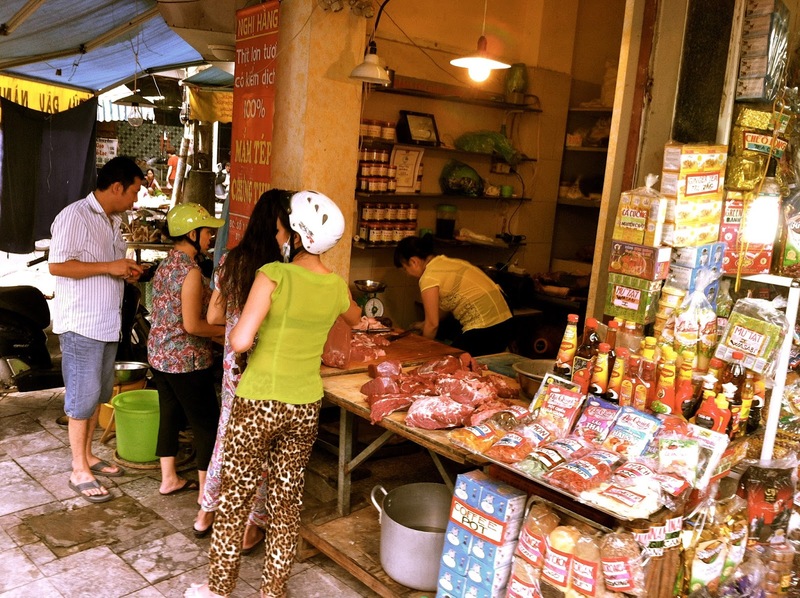 Market Life in Hanoi. 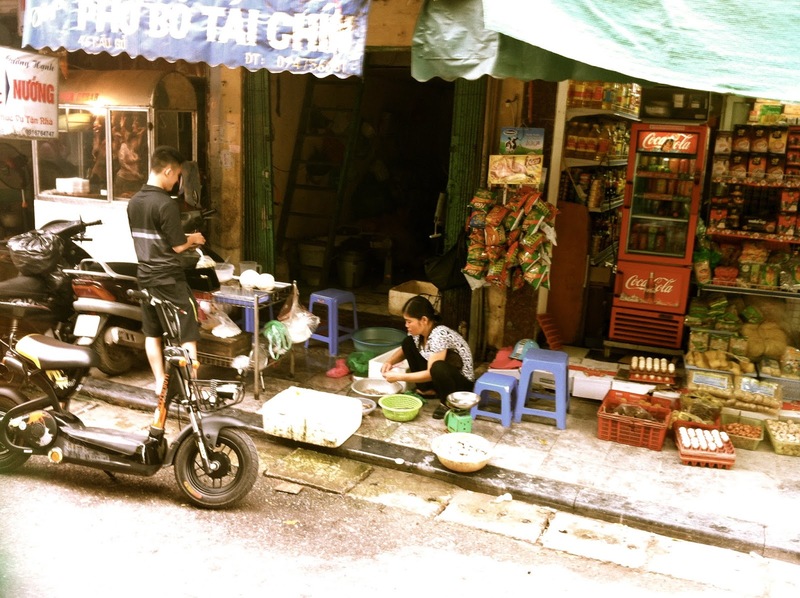 These photos made me a little jealous; I could have pretended to be Andrew Zimmern had I braved Vietnam in July. Perhaps next time. Poultry, fresh or roasted. Any guesses what might be hanging in the case on the right?